The initial Hawaii-based entity known as American Electric was founded in 1946 and quickly went on to forge a strong and credible reputation for its work across the Hawaiian market, both prior to and after the archipelago became the country’s 50th state. The focus on the islands faded, however, when the original ownership group relocated to the continental West Coast and sought to expand its business reach further into the mainland United States in the 1980s. The Hawaii operation contracted and the brand faded until Bob Dewitz decided to step in. And while his resume might not have made him the likeliest candidate to return the operation to previous levels of success, he saw that past experience as exactly what a flagging outfit needed most. “I saw an opportunity to reinvigorate the brand via involved and locally-based ownership,” he said. Three decades after his decision to get involved, the company maintains a workforce of 130 employees – down a bit from its peak level of 175 from a few years back, thanks, Dewitz said, to an intentional decision by leadership to be more selective in the types of work being pursued for bid and to boost the operation’s composite skill set by retaining the most productive and capable workers. A building that will house American Electric’s headquarters functions is under construction in the state’s largest city and capital, Honolulu, and the completed structure will ultimately include 7,500 square feet of office and support space on roughly 1.5 acres of land. 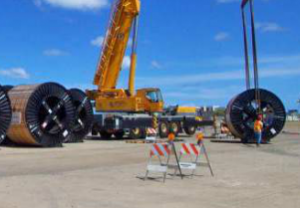 The company has additional branch offices on the island of Kauai and in both Hilo and Kona on the island of Hawaii, as well as an office/electrical apparatus service center on the island of Maui. Projects are typically done on an in-state basis only, but some work is performed for the military in the western Pacific. 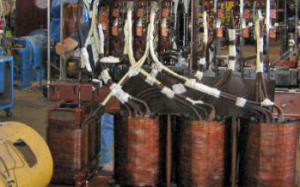 American Electric has recently marketed a sophisticated contracted electrical maintenance program called TEGG, which is typically sold to institutions or large commercial facilities seeking to ensure a high level of electrical reliability and mitigation of risk due to electrical equipment failures. 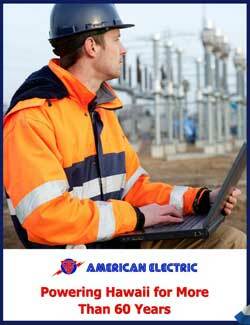 It also offers arc flash studies and related services, and the products are sold by a dedicated staff of five. The company’s largest uptick in recent business has come primarily from two sources. On the utility side, it has been involved in several alternative energy power plant projects, including a 30 megawatt waste-to-energy plant, a 120-megawatt biodiesel plant, a 28-megawatt woodchip biomass plant, an 8-megawatt biomass plant, a geothermal plant expansion and some wind-related projects. On the residential side, it has become one of the premier installers of residential photo-voltaic systems in the state – including those sold by the in-house team and those for which it serves as the engineering, procurement and construction firm. “The 8-megawatt biomass plant that we will complete by the end of this year has been particularly rewarding,” Dewitz said. “The plant was designed and modularized by a German engineering firm and then the modules were sent to Hawaii for construction. We have developed a very strong rapport with the developer by helping them with the on-site design and construction, solving a lot of unique challenges and ensuring the plant was delivered on time and at best cost. Dewitz said 2014 has ushered in the arrival of a business planning/process improvement program – called 20/20 Plan – that’s designed to better position the company for years to come. He said it denotes a clear vision for the future and underlines the fact that when American Electric’s newest apprentices become journeymen it will be 2020 and the company will want to ensure it is positioned to remain a top player in the market, as it is now. As for the longer term, he anticipates following the same steady course that has enabled the company to maintain the position of prominence it regained following the leadership change in the 1980s – with a healthy helping of the vision that’s kept it in tune with cutting-edge projects.